When prompted, save the file, and run it. 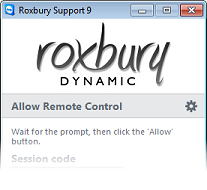 Let Roxbury know when you're ready to proceed, and we'll send a request to your computer. A message will popup requesting permission to control your computer. 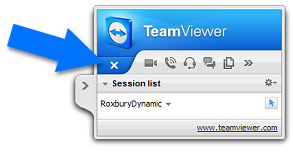 Click the 'Allow' button (the prompt will automatically close after ten seconds). To finish the session, simply close the program. This will terminate the connection. Alternatively, click the 'X' button on the control panel, usually found in the bottom right of your screen. Please note that we can only offer remote assistance to a Windows PC with a working internet connection. The speed of response, attention to detail and general advice proved invaluable in allowing us to maintain our commitments and deliver to critical deadlines. Thank you very much for all your help and assistance in setting up our new website. We have seen a significant increase in enquiries. We have already noticed a big increase in traffic and enquires. We would highly recommend you to anyone else setting up, or wanting to improve their existing web-site. A note to say thank you so very much for your constant care, professionalism and innovation when dealing with our websites and general IT needs. As we have expanded our operations the ongoing support delivered has been outstanding. In terms of value for money we couldnâ€™t have invested our resources better. No other quote came close and promised the same high level of service. 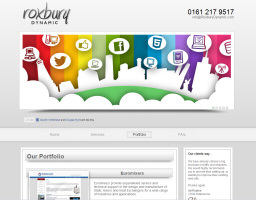 From the initial consulutation to today, Roxbury Dynamic have always delivered in all aspects of IT. They have also offered great ideas and technical expertise. They have given me outstanding value for money and my investment has paid great dividends. Thanks for another year of excellent service, long may it continue.